Yet many on the American Left still consider Hiss an iconic figure—an innocent victim accused of unsubstantiated crimes. They prefer to focus on the collectivist ideals Hiss stood for, rather than confront the reality of a man who systematically and methodically betrayed his country. Former U.S. Intelligence analyst Christina Shelton employs an in-depth knowledge of Soviet intelligence affairs as well as recently released Hungarian and KGB archival material to shine a fresh light on one of the most famous espionage cases. The story is dramatic, but Shelton’s analysis goes beyond sensationalism as she explores both the ideological motivation behind Hiss’s behavior and the lasting influence it has had on U.S. foreign policy. Why exactly were the intellectual elite so deter-mined that Hiss was innocent? His accuser, Time magazine senior editor Whittaker Chambers—originally Hiss’s Soviet handler—presented compelling written evidence. However, the intelligentsia were intent on supporting one of their own. They ignored the facts, a willful blindness that helped contribute to a polarization still in place in our country today. • Her persuasive argument that Communism and Fascism are not polar opposites, as has so long been claimed, but highly similar ideologies. • How Hiss’s central role at the Yalta Conference and the founding of the United Nations are examples of the significance of Soviet intelligence recruitment of high-level Americans who could influence U.S. foreign policy in their favor. • Why the silence surrounding the implications of Hiss’s espionage continues—and why apologists fear that smearing his name would undercut New Deal policies and the United Nations. Shelton doesn’t just detail the body of evidence pointing to Hiss’s gui< she suggests new layers of meaning in light of the current political landscape. Today, the importance of understanding Hiss’s ideological commitment has never been more vital. His advocacy of collectivism and internationalism still resonate among the political elite, making this book an important and timely analysis of American thought at this critical juncture in our country’s life. "A vigorous reappraisal of the Hiss-Chambers espionage affair, leaving no doubt of Hiss’s guilt. 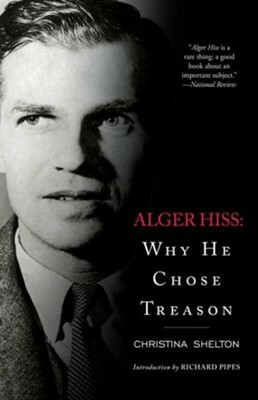 I'm the author/artist and I want to review Alger Hiss: Why He Chose Treason - eBook.